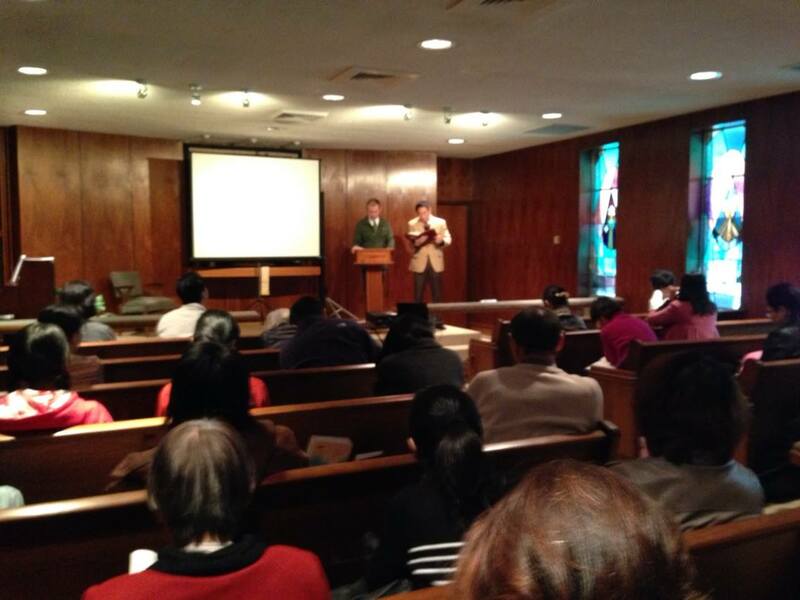 I had the great honor and pleasure of sharing with the Memphis Chinese Evangelical Church this past Sunday, December 15. The MCEC meets on the campus of Christ Church and they were so kind to allow me to be a part of their service. This is the message I chose to share on that occasion. I included forward slashes so I could pause for my translator. I actually learned that I had to include many more pauses along the way! But my translator did a wonderful job. God is completely different from anything else in the world. / Everything that is not of God and is not holy is denoted by the word, “common.” / The law which God gives to his people Israel in the Old Testament, with its standards of pure and impure, is based upon this distinction between God as holy and everything else as common. / In one word, the Bible asserts the sheer differentness of God. He is so different, so holy, that it was a grave sin for his people to try to make an image of him. / Any picture limits this God, / and even though the Bible uses the image of the sky to represent where God is, / it is ultimately only an image. The heavens don’t actually capture where God is, / but the sky has worked for us as a picture of what makes God so different, so transcendent, so awe-inspiring. / It’s not that God is merely distant / as if he chooses to remain far away. / It is not as if we are here in Memphis but God is in his mansion in Beverly Hills. No, God is up there, above us in some sense, although he is present everywhere. / If God lived in a big house in California we could drive a long way to meet him, / but God is not somewhere where we can make our way to him. / Since building the tower of Babel, we have striven to make our way to God / but the only thing that can really happen is that this God, holy and different and other as he is, would make his way to us. The season of Advent, the celebration of Christmas, is about this distance between heaven and earth. / During these weeks Christians focus our hearts and our attention on the good news that heaven and earth are not so distant, after all. For God, while not sacrificing his holiness, wishes to come and be with us. At Christmas we celebrate and allow our hearts to be shaped by the truth that we have a God who comes. / If this story was of a holy God who remained separate from his creation, the Bible would be very short. / We would at best be deists, those who believe in a God who created the world but has left the world to its own devices. / We would be a storyless people. / However, we live in the story of a holy God, a Father who is in heaven, but a loving Father whose reign comes on earth as it is in heaven. / And that is why we live and move and have our being in the coming presence of God and within an epic story of encounter with this God. Jacob has a visual encounter with the holy God. / It is a statement made in pictures that yes, the distance between this God and this world is as the ground to the unreachable heavens. / But there is a stairway. / The Hebrew word translated “raised staircase” in the translation I have used has traditionally been translated into English as “ladder,” hence the familiar term in the English-speaking world, “Jacob’s ladder.” / But the word is used only this time in the entire Bible and most likely refers not to a ladder but to a more solid staircase structure, such as the ancient ziggurat, if you’re familiar with those. God doesn’t show Jacob a vertical line that simply maps out the distance like something in a geometry textbook. / God doesn’t even show Jacob a slope that maybe he could climb up given the right equipment. / God shows Jacob a stairway. / A means of access from heaven to earth and from earth to heaven. / And God’s messengers, his workers, are going up, and they are coming down. Despite appearances, the amazing and beautiful truth that perhaps can only be communicated in the dream world, / is that heaven and earth are connected after all. / It is not a matter of us gazing up to heaven, wondering how we could ever make our way up there. / Heaven comes to earth. And it comes at this point in the story. / Amidst treachery, deceit, fear, murderous intentions. / And with this person, Jacob. / Why Jacob? / I must say, I just don’t like Jacob that much. / I have a series of Bible movies made for the TV channel TNT. / It includes films about such noble figures as Abraham, Moses, David, Joseph. / And it stars such illustrious actors as Richard Harris and Ben Kingsley. / And then there’s one about Jacob. / Played by Matthew Modine. / Not my favorite one. / In fact, I don’t think I ever finished watching it and if I did, I was probably reading a book at the same time. Now, Jacob has his moments, as we’ll see. / He acknowledges some of the wrong he has done over the years and recognizes the grace of God in his life. / Maybe that should be enough. / But for me, there’s not much that redeems him from being Jacob the trickster, Jacob the bargainer with God. / Aside from the tricks and lying there doesn’t seem to be much that is memorable about Jacob. / After all, he’s where he is in the story in this part of Genesis because he has taken the blessing that belonged to his brother by playing a nasty trick on his father. / And he will later gain much of his wealth by tricking his uncle Laban. / It makes it all the more strange, then, some of the stories that involve Jacob. / Such as the one we’ve just read. / An amazing God is bursting onto the scene and doing these wonderful things and on our end, representing us, is just Jacob. Maybe the problem is that I’m too much like him. / I want to see myself as Abraham or Moses or David because I think there are so many great things about myself, / but really all that I am is someone who is just as faulty as Jacob / or even as faulty as Abraham, Moses or David show themselves to be. / I would trick my way into a blessing, and run away out of fear / only to occasionally look back and have to acknowledge that it’s a wonder that God has been so gracious. But, while I’m being honest, I’m not too bothered when Jacob walks away limping after wrestling with God, as he does in chapter 32. That story is a rather strange one, but it gets even stranger when Jacob is given the new name, / Israel. / The weight of this name on this man seems like it should just squish him. / The name of the people of God throughout the entire biblical history first referred to this man. / God’s people chosen to be blessed so that through them God would bless the entire world—they go by the name “Israel.” / And the name goes back to a guy who got his blessing and part in the story by lying and trickery. And Jesus, is there anyone so favored by God? / And yet his 30 years walking this earth were nothing if they weren’t spent serving, and not being served. So why Jacob? / Because he is part of the story by which God reveals himself in all of his saving and restorative power to his wayward world. / Because, whether he got it by deserving it or stealing it, claiming it or stumbling across it, / Jacob carries the blessing of God by which God is going to set the world the way that God created it to be. So maybe the point here is not, Do you know who Jacob is? / Or even do you know who Israel is? / But rather, Do you know who God is? / Do you know who the one who creates Jacobs and Israels and Simons and Peters and gives them new names actually is? This is the God who has been at work since Jacob’s grandfather Abraham and his father Isaac in putting the world right. / This is the God who promises to bless the entire world starting with Abraham and his descendants, / renewing and saving the earth by beginning with a promised land within the whole world, / this world which is promised by God to be a place where heaven finally comes on earth/ where justice and righteousness cover the world as water covers the sea. God Almighty will bless you, / make you fertile, / and give you many descendants so that you will become a large group of peoples. / He will give you and your descendants Abraham’s blessing / so that you will own the land in which you are now immigrants, / the land God gave to Abraham. This blessing will go with Jacob to his son Joseph, / into Egypt with the people Israel, / through exile and slavery into redemption and freedom / and into homecoming with Moses into the Promised Land. / This Promised Land is a foretaste of God’s ultimate plan and our ultimate hope that the Promised Land is the whole world, / and that the recipients of the promise are not just Israel, / but all the nations of the earth. As with so many images and ideas in the Old Testament, the staircase between heaven and earth is a prophecy to be fulfilled. / There is a bridge between heaven and earth, / but they will one day be fully bridged. And it happens through God coming to be with his people. / There are a number of major clues in Genesis 1-2 that the earth is created as a giant temple, / something distinct from God but something in which the fullness of God would be pleased to dwell. / This God makes a people for himself, / dwells among them in a tabernacle, / is then housed in a temple in his people’s city of Jerusalem, / and would, as the Gospel according to John would put it, / finally become flesh and dwell among us. In John 1:51, Jesus tells Nathanael while calling him to follow him as a disciple, / “You will see heaven opened and the messengers of God ascending and descending upon the Son of Man.”/ Son of Man is one of the major ways Jesus identifies himself. / In this remarkable statement Jesus identifies himself with the vision of Jacob’s staircase. / He is the embodiment of heaven coming to earth. / He is the means by which earth has access to heaven. / He represents humanity to God, and he also represents God to humanity. / And in fulfillment of God’s own promise, Abraham’s descendant Jesus becomes the one through whom the entire world is blessed. That heaven comes to earth means God slipping into human skin. / That heaven comes to earth means Jesus born in lowliness. / That heaven comes to earth means Jesus sacrificing himself body and blood on a Roman cross and sharing himself in bread and wine. / That heaven comes to earth means Jesus embracing the children, the leper, / healing the blind and the crippled, / raising the dead, / telling parables and stories, / announcing that the poor will be rich, / that the lowly will be exalted, / that the blind will see, / that dead people will become alive, / that justice will win, / and love will have the last word. That heaven comes to earth is not something that is celebrated and recognized only at Christmas. / It is actually the story of the entire Bible and the story we find ourselves in. / The incarnation of God is at the very center of our Christian faith. / Not just that God became human only to save human beings from sin, / but that becoming human is the way in which God dwells in his creation he always intended to dwell in. / And at the return of Jesus all will be complete, / as the book of Revelation reads, “The home of God is among mortals. / He will dwell with them; / they will be his peoples, / and God himself will be with them” (21:3). Having Jesus, we find ourselves in the same place as Jacob. / Perhaps some of my dissatisfaction with Jacob can be resolved if I take note of how he responds to the presence of God. / As the story tells us, he rises early in the morning. / This is a biblical way of expressing the taking of action without delay. / Jacob does not hesitate. / He sets up a sacred pillar and renames that place Bethel, / which means house of God. / A place where God dwells, / as was the temple,/ as is Jesus,/ and as the entire earth will be one day. / And having taken action to the presence of God, Jacob moves on to where God would lead him to next. That heaven comes to earth then is not something we merely look back on. / We don’t simply remember that God has come to us. / Jesus has not only come; he comes. / The presence and coming of God is our hope that comforts us, / and it is our anticipation that leads us to action. This Christmas, I pose the question: / What do we do the next day? / Early in the morning, as soon as we awake, / after God has granted us our vision that he is not only with us but it is coming to us? / And that he works through us to save the world? ← The best Jesus book I’ve read. Thanks for sharing. I found the paragraph where you describe what heaven coming to earth means very encouraging.